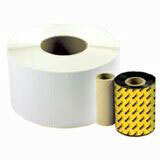 Wasp Label - 4" x 3" Thermal transfer paper label. 4 roll case. Additional Information: Outer Diameter: 4"
The Wasp 633808431068 is also known as Wasp Bar Code	633808431068	.